Cannot wait for Marissa's next release! Eager for a new series from her! Even more excited to meet her (again) in November on tour! In my own city! Yay for a short commute!! 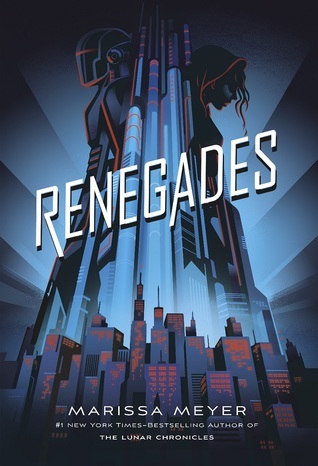 I'm so excited about Renegades as well! Oh I'm reading this one now! I have such high expectations so I hope it doesn't disappoint. I'm sure it won't. 😀 I hope you enjoy this book when you get the chance to read it! Interesting cover and I would try anything from Marissa Meyer. Haha, I hate waiting aswell! Seriously do not like to wait! :) Sounds like a great read. I cannot wait for Renegades! So far, I've liked everything Marissa Meyer writes so I'm hoping the same for this one. Thanks for stopping by. Happy reading! Waiting is terrible. I can't wait to get my hands on Renegades too. Oooh! I really want to read this book too, especially since I've been enjoy Meyer's works so far! Great pick! I keep seeing this book everywhere! I hope you enjoy reading this, Jessica. Have a great time meeting the author! The library usually has really good YA author visits. Maggie Stiefvater is here tonight. This is going to be a really popular book! I still need to read this author. I do like the sound of this one and the cover is wonderful! Great pick! I am loving the sound of this one! Yes! I can't wait to read it!